Put the top down on the convertible and crank this one all summer long! Jack Blades knows how to write hooks. And play a mean bass line. And sing his balls off, the way classic rock singers could really sing. The bassist and co-lead vocalist of multi-platinum bands Night Ranger and Damn Yankees, Blades has also received acclaim for his Blades-Shaw releases with Damn Yankees bandmate Tommy Shaw (of Styx fame). On his new solo record, Blades has assembled a collection of his pals to record what could have been a killer Night Ranger record if it featured the same artist roster on every song—and ditched the big keyboards in favor of a classic rock, multi-guitar assault. This is a guitar record from start to finish, and it rocks from the very first measure of the opening track, “Back in the Game.” But it was the third track, “Hardest Word to Say,” that blew us away, as it was every bit as powerful a ballad as the Damn Yankees hit, “High Enough,” but, dare we say, even better! If American radio weren’t such a piss-poor medium for discovering new music these days, this song would easily catapult the Blades machine to arena status. We loved the slight country vibe to vocal delivery in the chorus (not to mention the slide guitar), and the Def Leppard-esque rhythm guitars layered over the acoustics in the verse. Stellar production. “Anything For You” really showed off the Beatles inspiration that was at the heart of Blade’s early musical influence, with harmonies and vocal style that would make you swear that George Harrison was singing on this track. Songs cover a range of AOR styles from the ‘70s and ‘80s, but Blades applies modern production values with big guitar tones, dry vocals (compared to the ‘80s reverb wash), and clever vocal lines that show the man hasn’t remained lost in time. Did we say this CD rocks? OK.
Get through a few more songs and you land on “Rise and Shine,” a tune that starts out with you saying, “Wow, I didn’t know Jack was into Seattle-style alternative rock?” and by chorus time, the tune transforms into a KISS-meets-Skynrd anthem that has you pumping your fist in the air. Did we say this CD rocks? Featuring a collection of stellar musicians including Night Ranger bandmates Brad Gillis, Kelly Keagy, Joel Hoekstra and Eric Levy, and a guest appearance by Cheap Trick’s Robin Zander, the playing is top flight througout. You need to check this CD out. If you have any hope of writing songs that harness the power of a good AOR vibe, there is so much to be learned here that this CD just can’t be ignored. An adrenaline rush wrapped in solid musicianship, strong songwriting, and smooth production. Hailing from Israel, Early Rise’s debut release, What If, shows that they possess an impressive slate of musical ammunition ranging from powerful vocals to steadfast melodic compositions, and the open mindedness necessary to allow an interesting record. Also, What If effortlessly flows through your ear buds thanks to great production and mastering work. The band might conjure thoughts of Evanescence at first, simply because of the hard rock atmosphere and female vocals, but I think this is a far more ambitious release then any work I have heard from the aforementioned group. The song writing from Early Rise feels like they are trying to prove themselves, which makes for very compelling tracks. “Become Mad,” the opening track, begins with a tribal-like electronic beat and singer, Orly Lari, belting it out in the background. Then with a crunchy guitar slide, the song leaps into a very well constructed main guitar riff, backed up by a tight rhythm section and another supporting riff played up the neck, which is actually the first chorus but without lyrics — smart! The verse lulls into a predominant drum and bass section with textural guitars looming in the backdrop. The electric opener is revisited and extended in the bridge and then the song finishes off with another chorus, making for a strong opening track. In the title track, “What If,” piano, violin, and synths are incorporated for added ambiance, which matched up nicely with Lari’s angelic voice. The guitar solo in the outro is nothing too write home about, though, and the lack of compelling lead guitar soloing proves to be one of the downsides to the album, given the quality of the heavy rhythm guitar tracks throughout. Songwriting, in the context of choruses, arrangement, sounds, and transitions is illustrious but I wanted to hear more lead guitar lines. The areas that one would expect a guitar assault are usually replaced with Lari’s voice, and in that regard, it’s a bit of a parallel to Evanescence. I can’t fault the band for playing to their strengths (Lari’s vocals), though. It is very similar to the compositional styles of Saosin, another very riff heavy band with a talented singer. All in all, What If is impressive; having a balanced slant of brashy, riff heavy rock songs such as, “Become Mad,” “Face Me,” and “Wasteland,” but also displaying elegance with the tracks, “China,” “Goodbye,” and “Falling to the Ground.” The future for Early Rise is bright. Solid song writing, big guitars, a great female vocalist, and smooth production are a recipe for a success, albeit a tad familiar. Fun, lively, and extremely catchy electro-pop. The Brooklyn based duo, Oy Vey, comprised of Bryce Aubrey and Kevin Corcoran, certainly have an ear for melody. Recession Girls is loaded with infectious hooks and foot tapping sections that will lock itself inside your head for days. “When I Was Young,” “The City Picks Up,” and “The Horse’s Mouth” are just a few well deserving tracks to be blasting through your radio as you cruise down to the beach on a radiant summer day. And that is truly the vibe that Oy Vey encapsulates: fun in the sun… with a keyboard. The sonic expeditions that Oy Vey propels listeners through delivers a savvy array of textures that is made expansive with their incorporation of horns, bowed bass, opera vocals (courtesy of Catherine Spritzer), and an assortment of MIDI instruments, giving the songs impressive girth although the production quality isn’t anything more than average. Don’t get me wrong, it certainty doesn’t sound like the album was quickly pumped out in a bedroom using an iPad, but it doesn’t posses the refined and crisp qualities that the music is deserving of. The pedestrian production is succeeded by stellar songwriting that bears a resemblance to modern/retro acts like MGMT. There are bits of grit and electric chaos such as in the opening track, “The Brooklyn Side,” which has moments of compelling dissonance; lofty harmonies in songs like the single,“The Horse’s Mouth;” catchy synth breakdowns featured in “The City Picks Up,” and pop grooves throughout that make Recession Girls an exciting listen. Variety is one of the most deserving compliments for this album. As for musicianship, it’s just standard fare with no special accomplishments to boast about, but there is no big void as a result, either. The retro Eighties new wave vibe that Oy Vey encapsulates so well does fine without it. The best way to classify the to playing abilities on Recession Girls would be to say that it is “appropriate.” Focus is not on remarkable technique or expansive vocabulary but simplistic melodic ideas that are woven so neatly into an enjoyable album. Recession Girls is a great album that’s perfect for summertime. Its assortment of infectious dance grooves will surely help you dance off the dust from the docile winter and drink tequila until the sunrise. Soto delivers big by sticking to what he does best. Jeff Scott Soto’s last studio album, Beautiful Mess, was indeed a fine slab of pop, rock and soul that also featured some of Soto’s most introspective and personal lyrical themes. However, his fan base did not exactly welcome it with open arms for the simple fact that it was a bit of departure from the melodic hard rock the man is known for, and it’s safe to say this sentiment was not lost on the man himself. With that said, Soto’s new release, Damage Control, should leave his fans with nothing to complain about. Featuring a balanced cross section of melodic rock, AOR and metal, it is quite simply everything we have come to expect from the man. Highlights include the title track, which features that trademark Soto “big vocal” sound chock full of layered harmonies. “Die A Little” is one of the best JSS songs I have heard in a long time, and may be a contender for one of his best ever. “Take You Down” is quite possibly one of the heaviest songs Soto has done in a long while, and it reminds us that many moons ago, he began his career singing metal for a young Swede named Yngwie Malmsteen! “Look Inside Your Heart” and “ If I Never Let Her Go” place us right back in Soto’s comfort zone of Melodic/AOR with the former once again featuring a big, layered vocal sound on the chorus. The production on this release is slick: not overproduced by any means, but busy enough to serve up a real aural treat, especially when enjoyed on headphones. This time around Soto is joined by notable guests such as guitarist Joel Hoekstra, drummer Casey Grillo, Robin Zander of Cheap Trick and Y&T Guitarist/Frontman Dave Maniketti. In fact, Joel Hoekstra’s contribution extends beyond simply acting as a hired gun – he co-wrote a few of these great tracks with Soto as well. It is simply amazing that an artist as prolific as Soto can still deliver consistent albums such as this one without resorting to retreads, clichés or filler. Damage Control has everything long time fans could wish for, and is solid enough to win converts in a single listen. It’s a true pleasure to listen to from start to finish, and we highly recommend it for anyone who foolishly believes this type of arena rock is dead. Beautifully photographed book showcasing the history of guitars in America. 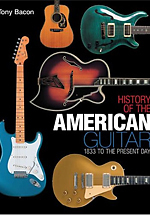 Tony Bacon updated his guitar book to cover many models introduced in recent years, and it serves as an excellent historical reference that spans the entire history of acoustic and electric guitars made in the United States. It’s also just plain fun to look at! The history of the guitar has far more years of acoustic design than electrics, which didn’t become popular until the ‘50s, so metalheads may not get as much enjoyment out of this diverse book as fans of country, Americana, and good old fashioned rock n’ roll. The photo collection is great: no guitar players, but rather just great images of iconic guitars throughout each period. If only our history books were this much fun to read back in high school! Bacon did an admirable job covering modern era instruments, as popular boutique makers are featured alongside the classic big boys such as Fender, Gibson, and PRS. Suhr, Tom Anderson, James Tyler, Collings, Parker, and Carvin all get some nice coverage. But we would have liked to see a few more modern examples, and were surprised that the Kramer guitar story wasn’t told in this tomb. Awesome; this is the embodiment of what progressive rock is. Get ready to take a journey through time and space. Spock’s Beard: The X Tour offers a great selection of songs from a great band, with an even more impressive stage show. If you enjoy the sound of classic prog rock you are probably already a fan of the band. If you are looking to expand your musical tastes and find something new, The X Tour three-disc set is great place to start. But we warned: the package can be misleading. Upon beginning the review, I was under the impression that the two audio discs were my primary focus, and the DVD, merely something extra. But after repeat viewings I came to realize that the DVD could easily stand alone. Merely giving the two CDs a listen on their own is not doing the band nor the music justice. So therefore, my recommendation is to watch the DVD first, as this will make listening to the live CDs that much more enjoyable. The live the show is incredible, and the band is very well-rehearsed. Incredibly, this show was filmed on the first night of the tour (a spur of the moment decision when some local friends offered to shoot the concert). You can imagine how nervous being filmed can be on something of this magnitude; yet, I’ve watched it several times and have yet to find any mess-ups on the band’s part! Some of my favorite songs: The opener, “The Edge of In-Between” is a great ear-catcher and immediately had me hooked. Among other songs I loved in the concert includined “From the Darkness” and “The Quiet House.” Spock’s Beard music often times can be very reminiscent of classic prog bands like Yes. A few notable sections on the second CD that really means nothing until you watch the DVD are “Drum Duel” and “Ryo’s Solo.” I won’t spoil it, but it’s thrilling to watch these musicians play and put on a show, and the visual aspect is just as important in this case. While all these musicians have extreme technical proficiency, chops, showmanship, and the ability to change musical styles in the blink of an eye, I have to mention Nick D’Virgilio. From his skills as a vocalist, guitarist, and drummer it seems to me like he’s some sort of musical Renaissance man. What talent! Given that D’Virgillio officially left the band this year due to his busy schedule with Cirque Du Soleil as a musical director, this concert marks a fitting tribute to his amazing talent. He is a musician’s musician. The only criticism I can possibly muster up is that the music itself isn’t for everybody, and you can get lost or bored if it doesn’t tickle your fancy. This DVD/CD set is not for you if you just don’t enjoy long, drawn out musical pieces or prog music in general. Chances are, though, if you’re a musician that appreciates quality songwriting and musicianship, it’s really hard not to find enjoyment and/or fulfillment here. Of course, you could just be humbled by everything that these guys do. And remember: Watch the DVD first! Composer, Arranger, and Bassist showcases her talents with a colorful pallet of funk and fusion. Amanda Ruzza’s solo CD titled, This Is What Happened, is a great showcase of her jazz composition and arranging skills as well as her diverse talents as a bassist. Though primarily jazz influenced, the CD of seven compositions is a fusion of mainstream and contemporary flavors allowing her to perform multiple bass styles from funk to straight-ahead, melodic bass lines. Coming from a very capable bassist, one usually expects a solo CD to have their instrument as the primary focus—not so with Amanda’s CD. This Is What Happened features a group of very established musicians giving each instrument the ability to breath within the composition and expand upon their individual artistic abilities through melodic harmonies and extended solos. Artists on the CD include: Mauricio Zottarelli / drums and percussion; Alex Nolan / electric and acoustic guitars; Mamiko Watanabe / Rhodes piano; Cliff Korman / piano; David Binney and Lucas Pino / saxophones; and Chris Stover / trombone. Highlights include the opening track, “Larry and I,” which features Amanda’s ability to lay down some excellent funk bass playing while transitioning into a straight ahead Samba feel. The second track is the only selection on the CD not composed by Amanda. “Pagao,” composed by Pixinguinha, features a doubled head by bass and trombone—an excellent showcase of a melodic duo, before transitioning into a trombone solo followed by a bass solo. The title track, “This Is What Happened,” features the saxophones in the melody and solo sections of the compositions before transitioning to Rhodes piano and then bass guitar. The production on this release is very well done. Showcasing excellent musicianship and being able to hear every intricate detail of the performance gives this CD a very dynamic coloration. The voices of each instrument are perfectly mixed to create a pallet of sound complimentary to each composition and artist, capturing every breath and feel of the performance. Amanda Ruzza is definitely an artist to give recognition to for both her composition and bass performance abilities, not to mention the artists she surrounds herself with. Innovative, melodic, and moody, OSI serves up heavy prog rock with inspired performances and production. If you love Porcupine Tree as much as you love Pink Floyd, there’s nothing more to read here. Get the new OSI album, Fire Make Thunder, and you’ll be in for a fantastic treat. OSI is the collaboration of Jim Matheos (Fates Warning, Arch/Matheos) and Kevin Moore (Chroma Key, long-time-ago Dream Theater). On this fourth studio release, they are joined by Porcupine Tree drummer Gavin Harrison, and that could be reason enough for many of you to nab this release (and by nab, we mean purchase it, please). Matheos handles guitars, bass, and some keys, while Moore is the obviously well-known keyboard player, as well as this band’s vocalist. The album is rich in sonic tapestries. The textures and layers are plentiful, and songs evolve over time in ways that deliver a great range of emotion, from mellow and brooding to angry and heavy, though the songs rarely, if ever, get past the mid-tempo range. No real singles to highlight, as it’s just a great listening experience from start to finish. If we had to pick a few highlights, though: “Enemy Prayer” and “Big Chief II” are two favorites, each with a great Porcupine Tree vibe, and the tight, punchy rhythms and layers of guitars and keyboards really drive the songs along, while Moore’s vocals have a very Dave Gilmour-ish vibe that suits the mood beautifully. The production work is great, and this CD is a nice treat for headphone listening. The mastering was great, too, and we mention that because so many new releases are mastered in a way that makes it hard to listen to entire albums from start to finish without some hearing fatigue. Straight-ahead rock with some big ‘80s influences and plenty of guitar riffs, shred solos, and layers of keyboards. Güru, the self titled debut CD from a band of studio/session musicians who hail from Spain, is sure to capture fans of ‘80s-era rock bands like Toto, Heart, and Chicago. With big vocal harmonies, melodic shredding guitar solos, and rhythmic grooves, every track provides a memorable hook you’ll find yourself repeating in your head. The bar is set high for the entire 13-track CD thanks to the title track, “Addictive Love,” featuring a rocking rhythmic melody a la Styx, Toto and Chicago. With the signature Strat guitar riffing and horn stab lines supported by those ‘80s keyboard pads, you’ll find yourself listening to something new yet seeming very familiar. The vocals through the entire CD are top notch, supplied by the fantastic guitarist, David Palau, providing excellent harmonies and blend. And from a rhythm section standpoint, these guys are tight! Track three, “Sometimes,” is a rock ballad showcasing excellent lead vocals and great guitar soloing—very AOR. “Your Smile,” is another visit back to the sounds of Toto and Chicago with a twist of Take 6-like vocal melodies and harmonies, introducing rock with funk and jazzy influences. The tune is very addictive and self-inviting. “I Just Can’t Get Away” starts out very bluesy before changing things up in the chorus, transitioning to a more heavy, rockin’ groove. Keyboards play a prominent role in this tune laying down some great soundscapes. Overall, both keyboards and guitars display expert musicianship. “Flavour of Desire” provides some more contemporary sounds and heavier guitar chugs. But when you get to the chorus section, you enter a more pop, Toto-like section: very melodic with prominent guitar riffs throughout a la Steve Lukather. For the most part, the writing and feel is consistent throughout the collection of compositions. The production quality on this CD is great, though a little lacking on the bottom end of the frequency spectrum, where more depth was needed. However, from a talent and performance standpoint, Guru is a band of very talented musicians capable of composing great rock tunes with catchy hooks and driving rhythmic grooves. If you’re a fan of ‘80s AOR rock and pop, Guru is a band to put on your radar. They provide an excellent example of some great writing and performance that blends the sound of yesterday with today.